• Obtaining funds in the present climate has become increasingly difficult. • Trying to organize an entire fundraising campaign can be daunting to say the least. Once formed, a committee must then try to determine the most efficient and cost effective way of proceeding with the project, decide on structure time-line prizes, printing needs and costs, promotional equipment, sellers incentives, organizational requirements etc. • This often entails to a lengthy process and ultimately one that hasn’t fully maximized the situation, thus limiting potential income. • This is a common occurrence and shouldn’t be held against either the committee or the club itself, they are undertaking a project which they likely have minimal, if any, experience in organizing and one that requires precision planning & execution. • …and that’s where we come in, Midland Travel are experts in the field! We have dedicated team of professionals who specialize in helping clubs around the country significantly boost funds – Quickly. • A hassle free way of generating essential funds. All aspects of organization are covered by midland Travel. • No massive outlay for the club to incur like printing, design and acquiring prizes etc. All prizes, draw cards, promotional material, incentives, delivery cost & all other items which are needed to run the initiative are provided by Midland Travel. • It cannot be don’t any cheaper; the prizes alone are at cos price, while printing and design can run anywhere upwards of €500. • We have a 100% record in generating new funds for organizations. Every single club that ran a project with us made significant profit. • Experienced, well established and Irish owned, fully bonded & licensed travel agents, so as soon as your draw is complete you pass on your details to the winners and you’re done! We take care of everything else. 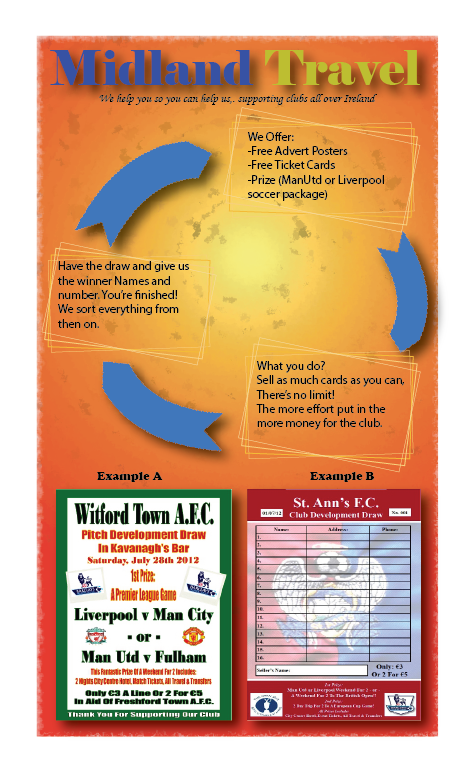 • After discussing the range of options available with one of our fundraising specialists the club then decides on a package that best suits their needs, with all material specifically tailored to the club i.e. crests, colours, what the fundraiser is in aid etc. • Midland Travel will then formulate proposals on draw cards layout and related matters i.e. number of cards required, how many lines, poster proofs, colour scheme etc. and makes recommendations on this due to our vast experience in successfully identifying how best to create a successful campaign, but the club will obviously have the final say on all matters. • All the materials and organization necessary to run the project are provided as part of the package; promotional full A3 & A4 posters, permission slips professional back-drops for store collections etc. and prizes. • The prizes are fantastic, ranging from sun or ski holidays to family adventure vacations and weekend sports breaks and include all accommodation, travel, transfers, associated event tickets, taxes, baggage fees and service charges. There is absolutely nothing extra for either the club or prize-winner to pay for! • The event is promoted throughout the country, and as we only do one club in any area to avail of the project, it guarantees to maximise the potential profit. Please contact our office to speak with one of our fundraising specialists who will be delighted to discuss the best options for your particular organisation, all fully customised and tailored to your individual needs.